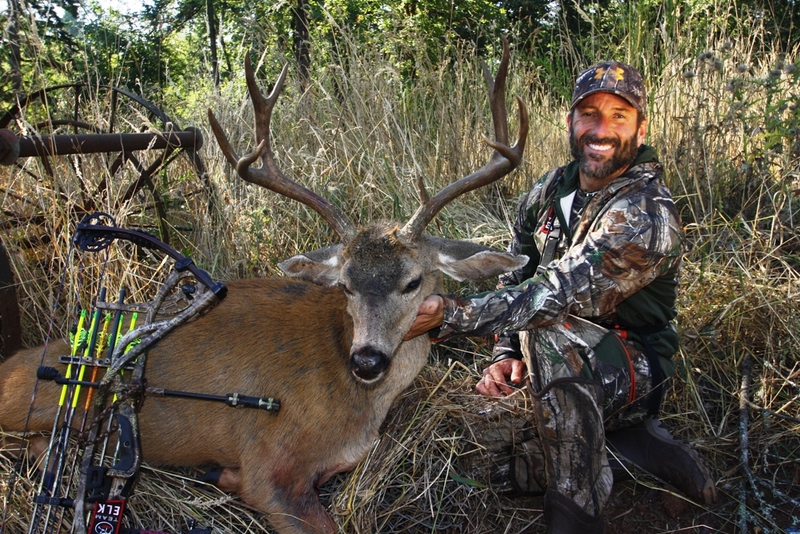 “Beast Mode” Oregon Blacktail…on a HEATER! Cameron Hanes / General / “Beast Mode” Oregon Blacktail…on a HEATER! 1. When in a state of serious training or at a level of high effort. 2. Superhuman state of being, in which animal instinct takes over mind and body. • When Ryan returns the football kickoff he enters in to Beast Mode. 3. Playing at a level where one physically and mentally dominates their opponents. • Animal was going Beast Mode in practice. 4. The act of going to the gym and lifting hard, normally with a purpose or motivation behind it. • After mikes most recent break up he has been in Beast Mode every day. 5. A state of superiority or awesomeness. It’s September, which means, it is elk season. This is when I want to peak, physically and mentally. I work all year preparing for the month of September…a month of mountain elk hunting. Eleven months of running, lifting and shooting with one goal in mind, to arrow a big bull(s). On the heels of my last blog post on www.cameronhanes.com we know, even though it is still early September I have arrowed two bulls. One in Utah and one in Oregon. As a bonus I also arrowed a good 4-point mule deer in Utah. Because I killed my elk quickly here in Oregon, I have a little break prior to my Colorado elk hunt in the San de Cristo Mountain Range. What to do? Some might take a breather to recharge after two weeks of intense bowhunting on film. For the Beast Mode bowhunter, ya’ll know what we do…..we keep hammering! In poker when you get on a “heater”, which is a run of getting extremely good cards, you don’t leave that table for any reason! All in baby! Well, for me in my bowhunting life, this season I’ve been on a heater. 7 for 7 thus far in 2011 and with a week before my Colorado departure I gotta keep the pedal to the metal. I can’t leave the table. With an intact Oregon blacktail tag in my pocket, that means one thing – I was on a mission to find a trophy class blacktail buck! Last year, towards the end of August, I arrowed a nice Pope & Young 4×3 blacktail on film for my dvd Bowhunting Trophy Blacktail. After doing so me and my hunting partner/cameraman Chad Montgomery decided that come late August every year from here on we’d have our stands up and be ready to hunt “just in case” . Normally, we wait until November when the deer are rutting and the action if fierce, but in case a huge buck showed up on our trail cameras during the “early” season here in Oregon, or a bear, or a few spare days came free like this year….well, we’d be ready to act. That brings us to this Labor Day weekend. I’d have three days to get it done on our target buck so far in 2011, a big, wide, 4×4 with one eye-guard. Man, I couldn’t wait. Could I keep my heater going? Could I stay in Beast Mode, preparing hard for my last two elk hunts of September? As I mentioned, my life during this time of year revolves around elk hunting the mountains. While I love bowhunting blacktail, I couldn’t and wouldn’t let doing so affect my training regiment for my “Super Bowl”. This meant in between blacktail hunting over the weekend I’d need to still run, lift and shoot. I’ve worked so hard this season getting physically prepared I didn’t want to take a hit mentally by skipping my work outs…I didn’t want to lose my EDGE!!!! To some, this might sound ridiculous, unnecessary or over-the-top. To fellow Beast Mode Bowhunters, this mindset makes PERFECT SENSE! Heading to the stand this weekend, I was jacked up. I had lots of good trail cam pics of the wide 4×4 and was hoping to catch a glimpse. Tanner, my oldest son, would be filming for me in between his work shifts at Cabela’s. After getting up at 4:00 a.m. for unscented showers, and heading to our stands to be in the tree, quietly sitting a good hour before daylight to let everything settle down, as it neared 8:00 a.m it was already feeling like a long day! (Trail camera clock on the image of my buck is an hour off by the way…says 7:15 a.m. It’s actually an hour later). And, all we had seen to this point was a young forked-horn. Dang. Just then I caught movement down the trail. A couple does and the 4×4 were headed our way. It was late. I’d never captured a photo of him in the daylight so I had assumed after he didn’t show up right at day break we’d probably never see him. I was happily mistaken. We stayed still as statues, frozen. She never settled down but she did keep coming up the trail, painstakingly slow. Stomping, head up, ears forward on high alert. The deer behind her, including my buck seemed not real concerned with her alarm. She was a small deer and actually in looking at the video I think “she” might actually be a “toe head”. Regardless, I likened this situation to a calf elk spooking. It is rare that a calf spooking can cause the entire herd to run. They pretty much just blow the calf off and I think that is what was happening here. The older deer hadn’t seen anything. And beings that we were 25-feet in the air our scent was well above their nose. Keep coming baby. It took about 45 minutes for them to go 50 yards but eventually the buck was in position. The young deer was still carrying on, which had me moving as slow as I ever have lifting that bow and easing the string back. I held at full draw for quite some time as the buck moved around a bit before finally offering me a perfect, quartering-away shot at 12 yards! I picked spot, relaxed and squeezed the trigger of my release knowing full well Tanner was capturing all the action on my Canon high def camera. I crushed him and actually thought he might go down on impact. He stayed on his feet crashed through the thick brush for about six seconds and it was over. Wow….that was intense. Me and Tanner gave each other props for both doing our job, got down from our stands (no 30 minute wait on this dude), recovered the arrow, blood trailed and soon enough were at my big 4×4 feeling real happy with this morning hunt. Tanner helped me capture some great photos, and then I broke the buck down there in the field – skinned and quartered him as Tanner made a couple trips hauling all of our gear back to the truck. One load out with the meat and we were on the road about an hour after I arrowed him. Besides sharing an awesome hunt with my son and tagging another big blacktail (that never gets old) I still kept that edge for Colorado (& New Mexico) by shooting four groups of arrows when I got home, running 7 miles with my wife Tracey that afternoon in the heat and lifted with Tanner at 10:00 p.m. that night. Run. Lift. Shoot. I am on a heater and I can smell 10 for 10 come the end of September.